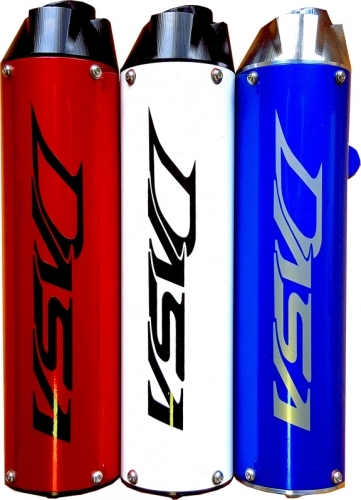 All Honda TRX450 Dasa exhaust systems are handmade here in the USA and the quality really shows with perfect tig welds, trick billet end caps, a billet canister mount, thick head pipe flange and the end caps do unbolt for easy canister repacking. The Honda TRX450 Dasa exhaust system has been proven on the dyno to make big HP throughout the entire power curve. This is a multi-step, stainless steel exhaust system that includes a head pipe, mid pipe, and an exhaust canister. This exhaust system has countless national motocross victories, four stroke wars wins, AMA and ATVA championships. The 99db version is for closed course racing ONLY, a spark arrestor and/or quiet core cannot be installed on this version. The Classic version is louder at 102db but a spark arrestor and optional quiet core can be added to this version to get the sound down to around 98db. This is the best system where noise is not a concern and you need flexibility in your exhaust setup. The Shorty version can is 4" shorter than the Classic. It's the loudest Dasa option and and now comes with a billet mounting adapter. Optional Quiet Core is available for the Classic model only and is sold separately. Optional Dasa jet kit available which includes the recommended OBEL-R needle(2006+), pilot jet and main jets. Optional black anodized end cap and inlet for the Classic and Shorty versions only. Optional can colors available. Black is standard. Colors may add additional production time. Ceramic coating available to help reduce heat and obtain a stealth black look on the head and mid pipes. Overall a great exhaust. I have had many Dasas over the years and have never had any issues and the new steel wool packing these come with lasts a long time. Do your own research, almost everyone swears by Dasa for the TRX. Seems like they are right, the Classic is a beast! You can't beat this exhaust for performance, sound or looks. Best part is you can add a quiet core to get it under 100db if needed. All my quads have Dasa on them! !